Antimicrobial peptides (AMPs) are a class of antimicrobial agents with broad-spectrum activities. Several reports indicate that cationic AMPs bind to the negatively charged bacterial membrane causing membrane depolarization and damage. However, membrane depolarization and damage may be insufficient to elicit cell death, thereby suggesting that other mechanism(s) of action could be involved in this phenomenon. In this study, we investigated the antimicrobial activity of a novel antimicrobial peptide, TP359, against two strains of Pseudomonas aeruginosa, as well as its possible mechanisms of action. TP359 proved to be bactericidal against P. aeruginosa as confirmed by the reduced bacteria counts, membrane damage and cytoplasmic membrane depolarization. In addition, it was non-toxic to mouse J774 macrophages and human lung A549 epithelial cells. Electron microscopy analysis showed TP359 bactericidal effects by structural changes of the bacteria from viable rod-shaped cells to those with cell membrane damages, proceeding into the efflux of cytoplasmic contents and emergence of ghost cells. Gene expression analysis on the effects of TP359 on outer membrane biogenesis genes underscored marked down-regulation, particularly of oprF, which encodes a major structural and outer membrane porin (OprF) in both strains studied, indicating that the peptide may cause deregulation of outer membrane genes and reduced structural stability which could lead to cell death. Our data shows that TP359 has potent antimicrobial activity against P aeruginosa. The correlation between membrane damage, depolarization and reduced expression of outer membrane biogenesis genes, particularly oprF may suggest the bactericidal mechanism of action of the TP359 peptide. With continuous usage of antibiotics overtime, pathogenic bacteria buildup resistance, and this is a major drawback for the treatment of a plethora of bacterial infections. Hence, there is an increasing need for antimicrobial agents with novel mechanisms of action, which target essential cellular metabolic processes and pathways. In order to combat recalcitrant pathogens, essential targets for viability, growth and pathogenicity must be identified . Antimicrobial peptides (AMPs) are a class of antimicrobial agents that have been of interest, and they are considered to be a potential substitute for conventional antibiotics . AMPs are a group of bactericidal molecules of the innate immune system in multicellular organisms and in unicellular organisms, represses competing species . Cationic AMPs are small positively charged amphipathic peptides; having both hydrophilic and hydrophobic ends, which enable the molecules to be soluble in aqueous medium and to penetrate lipid-rich membranes of bacterial cells. It is well established that electrostatic attraction between the positively-charged antimicrobial peptides (+2 to +9)  and the highly negative-charged bacterial membrane enables the first step of attachment of the peptide to the bacteria . The negative charge is due to composition of the membranes of bacteria, which is different from eukaryotic cells. This difference partially explains the sensitivity of bacterial cells to AMPs and the lack of toxicity to eukaryotic cells . Although the exact mechanisms of action of AMPs are not fully understood, several have been proposed, such as the interaction of AMPs with membranes in the carpet, toroid and barrel-stave models  causing membrane damage. Additionally, other mechanisms of action have been attributed to the integration of AMPs into the cytoplasmic membrane. However, membrane perturbation/depolarization alone may not be sufficient to cause cell death by cationic AMPs, as reported for gramicidin S action against P. aeruginosa . Furthermore, there is a gap in studies addressing the interaction of AMPs with essential genes involved in cellular metabolism and membrane biosynthesis genes. P. aeruginosa is a ubiquitous Gram-negative bacterium and one of the most important clinical opportunistic pathogens. It is a persistent pathogen associated with nosocomial infections , wound infections [10, 11], urinary tract infections (UTIs) , otitis media, nasal infections  acute and chronic lung infections in artificially ventilated  and cystic fibrosis (CF) patients [15, 16]. P. aeruginosa infection is difficult to eradicate completely, especially in CF patients, in whom, infection results in decreased lung function and uncontrolled inflammation [17, 18]. It continues to pose a therapeutic problem due to drug resistance developing during therapy, caused by low permeability of its outer membrane, multi-drug efflux pumps and AmpC β-lactamases  resulting in high rates of morbidity and mortality. Additionally, during the initial colonization of P. aeruginosa, the non-mucoid phenotype is the dominant phenotype, however, as the infection progresses there is a switch to a more persistent mucoid phenotype . This conversion results from the production of a large quantity of alginate , which is followed by the formation of a protected biofilm of micro-colonies [15, 22, 23], resulting in persistent infections , poor prognosis of infected patients and mortality and morbidity in CF patients. The mucoid state also enables P. aeruginosa to elude opsonization, phagocytosis, and digestion by host defense mechanisms . In this study, the antimicrobial activity of a novel antimicrobial peptide TP359 was investigated against a mucoid and a non-mucoid strain of P. aeruginosa. We assessed its effect on membrane biogenesis, peptidoglycan-associated genes and on essential genes of P. aeruginosa in order to determine the possible mechanisms of action of AMPs. P. aeruginosa strains ATCC 39324 and ATCC 27318 used in this study were purchased from the American Type Culture Collection (Manassas, VA). Cation-adjusted Mueller Hinton broth (CA-MHB; Becton Dickson, Franklin Lakes, NJ) was used to grow the bacteria for determination of in-vitro antimicrobial activity and time-kill assays. Luria-Bertani medium (LB; Becton Dickson) was used for the membrane-depolarization assay and quantitative real time-polymerase chain reaction (qRT-PCR) analysis. Todd-Hewitt medium (Becton Dickson) supplemented with yeast extract (THY) was used to grow the bacteria for scanning electron microscopy (SEM) and transmission electron microscopy (TEM). Gentamicin sulphate and polymyxin B were purchased from Fisher Scientific (Pittsburgh, PA). The proprietary antimicrobial peptide (AMP) TP359 (MYR-KKALK-[K]D-amide, C41H81N9O6) was synthesized with > 95 % purity by Therapeutic Peptides Inc., (Baton Rouge, LA). The structure of TP359 was predicted de novo by converting the peptide sequence to its tertiary structure using PEPStr; a method for tertiary structure prediction of small bioactive peptides . TP359 was one of several proprietary AMPs from Therapeutic peptides Inc. that was screened for antimicrobial activity against P. aeruginosa (data not shown). TP359 showed enhanced antimicrobial activity against P. aeruginosa and thus was selected for further studies. We evaluated the bactericidal activity of TP359 against P. aeruginosa by first determining the minimum inhibitory concentration (MIC). TP359 was serially diluted 2-fold starting at 64 to 0 μg/mL and added into non-treated polystyrene 96-well plates, according to the Clinical and Laboratory Standards Institute (CLSI) M7-A7 method  as previously described . Each well was next inoculated with 20 μL (1 × 106 CFU/mL) of either strain of P. aeruginosa in CA-MHB to a final concentration of approximately 1 × 105 CFU/mL. Bacteria alone served as positive control to verify bacteria growth, while negative control wells contained only media to ascertain culture sterility. To determine the minimum bactericidal concentration (MBCs)  we used TP359 at two or three concentrations higher than its MIC. The bacteria concentrations were then plated on Luria agar (LA) plates and viable CFU/mL counts were enumerated by plate count assay. The time-kill studies of TP359 against both strains of P. aeruginosa were performed as we recently reported , according to the M26-A guidelines of the CLSI . Either P. aeruginosa strains (1 × 105 CFU/mL) were inoculated into non-treated polystyrene 96-well plates containing TP359 concentrations correlating to their respective MICs (0.5×, 1×, 2×, 4× and 8× MIC). Viable cell counts were determined after 2, 4, 8 and 24 h of incubation at 37 °C by plate count assay. Cell lines used in this study were the human lung carcinoma epithelial A549 cell line (ATCC® CCL-185™) and the mouse J774 macrophage cell line (ATCC® TIB-67™). A549 was used because P. aeruginosa is known to infect the respiratory tract of cystic fibrosis (CF) patients, while macrophages are the first line of defense during infection. The A549 and J774 cell lines were cultured in F-12K Medium (Life Technologies, Grand Island, NY) and Dulbecco’s Modified Eagle Medium (DMEM, Life technologies), respectively supplemented with 10 % fetal bovine serum (FBS; Life technologies) and 1 % 100× antibiotic-antimycotic (Life technologies). The cytotoxic effect of TP359 on cell lines (A549 and J774) was determined using the Cell-Titer 96® Non-Radioactive Cell Proliferation assay kit (Promega G4000, Madison WI) as previously described . The effect of TP359 on outer membrane integrity of P. aeruginosa was analyzed using the LIVE/DEAD BaclightTM viability kit L13152 (Molecular probes, Life Technologies) according to the manufacturer’s protocol. Overnight cultures of bacteria were inoculated into THY and grown at 37 °C to an optical density of 0.1 (1 × 109 CFU/mL) before being exposed to 4× MIC for 4 h. Negative cultures included those without added peptide. Cultures were centrifuged at 2000 × g for 10 min, washed, further incubated in 1 mL of 0.85 % NaCl for 1 h and then finally re-suspended in 200 μL of 0.85 % NaCl. Bacteria cells were then incubated in the dark for 45 min in a 2X stock solution of the baclight staining reagent containing a final concentration of 6 μM SYTO 9 and 30 μM of propidium iodide. Images were captured using a Nikon Eclipse TE200 microscope (Nikon, Melville, NY, USA) using FITC-HYQ (Ex 450–500) and TRITC HYQ (Ex 530–550) filters. Cytoplasmic membrane depolarization was determined using the fluorescent dye 3,3-dipropylthiacarbocyanine iodide [DiSC3(5); Fisher Scientific, Waltham MA] as described  with some modifications. Exponential-phase bacteria at approximately 1 × 109 CFU/mL in buffer (5 mM HEPES, 5 mM glucose; pH 7.4) were incubated in 0.4 mM DiSC3 (5). After this, KCl (100 mM) was added to equilibrate the cytoplasmic and external K+ concentration followed by addition of bacterial suspension with either peptide, polymyxin B or gentamicin sulphate to optiplate 96-well white plates (Fisher Scientific) for concentrations ranging from 10 to 80 μM. The fluorescence intensity was measured by using the Hidex Plate Chameleon V (Lablogic Systems, Brandon FL) with an excitation wavelength of 622 nm and emission wavelength of 670 nm. SEM and TEM analyses of untreated- and TP359-treated exponential-phase bacteria (1 × 109 CFU/mL) were performed essentially as previously described . Bacteria were exposed to approximately 4× MIC for 4 h at 37 °C prior to analyses. To determine the effect of TP359 on P. aeruginosa genes essential for viability, cellular metabolism, pathogenicity, outer membrane biosynthesis and assembly (Table 1), were analyzed using qRT-PCR under bacteriostatic and bactericidal conditions. The bacteriostatic condition is indicated by bacterial recovery after 18 h of TP359 treatment, whereas at the bactericidal condition which causes cell death; samples were treated for a shorter time, to avoid complete cell death. P. aeruginosa at 1 × 105 CFU/mL were exposed to 0.5× MIC of TP359 and grown for 18 h in a shaker incubator at 37 °C to evaluate the bacteriostatic effects of TP359. For the bactericidal condition, P. aeruginosa at 1 × 109 CFU/mL were exposed to 4× MIC of TP359 and grown for 4 h, and subsequently for 10 and 30 mins to compare the effect at these time period to the bacteriostatic 4 h treatment condition. Also, ​P. aeruginosa at 1 × 109 CFU/mL were exposed to 4× MIC of gentamicin and grown for 4 h for control. Total RNA samples from both conditions were purified using an RNeasy Mini kit (Qiagen, Valencia, CA), and quantified using a spectrophotometer (Nanodrop 2000c, ThermoFisher Scientific, Waltham, MA). The cDNA synthesis was carried out using the Applied Biosystems High Capacity cDNA Reverse Transcriptase Kit (Life Technologies). One microgram of RNA was used to amplify selected key outer membrane biogenesis (oprI, oprL, oprF, acpP, uppS and opr86), cell division (ftsA and ftsZ) and virulence (ampR and lasR) genes of P. aeruginosa using the Applied Biosystems ViiA 7TM real time PCR system (Life Technologies). Primer pairs for each gene are shown in Table 2. The amplification conditions used were one cycle of initial denaturation at 95 °C for 2 min, followed by 40 cycles of 95 °C for 15 s, 56 °C for 25 s and 72 °C for 30s. The relative changes in gene expression were calculated using the equation: 2−ΔΔCT  where all values were normalized with respect to mRNA levels of the house-keeping gene, rpoD. Fold changes in mRNA gene expression levels were calculated relative to untreated bacteria samples. Each real-time PCR assay was performed in triplicate from three independent experiments and the results are expressed as the mean ± SD. The outer membrane proteins (OMPs) were extracted using a method described previously with slight modifications . Briefly, 0.5 L of mucoid and non-mucoid P. aeruginosa (1 × 109 CFU/mL) was either treated with TP359 (4× of MIC) or left untreated (control) and were grown for 4 h, and centrifuged at 2000 × g (Sorvall ST 40R, ThermoFisher Scientific, Waltham, MA) for 10 min. The cell pellets each from control and treated cultures were re-suspended in 800 μl of 100 mM TrisHCl lysis buffer (0.5 M sucrose, 0.5 mM EDTA, pH 8.6) and 4.2 ml of 50 mM TrisHCl lysis buffer (pH 8.6) containing 0.5 M sucrose, 0.5 mM EDTA and 2.5 mM MgCl2) and incubated on ice for 15 mins, followed by centrifugation at 7000 g at 40 °C. The supernatant contained the periplasmic fraction and the cell pellets were re-suspended in 20 mM TrisHCl (pH 8.6) containing 0.5 M sucrose, 0.5 mM EDTA), followed by sonication on ice using a cycle of 40 % amplitude, for 5 min, 120 W at a frequency of 20 kHz on a Biologics Ultrasonic Homogenizer (Fischer scientific, USA). The sonicated suspension was centrifuged for 10 min at 7000 g at 40 °C to remove the cell debris, followed by ultracentrifugation (Beckman coulter, USA) at 132,000 g at 40C for 1 h to separate cytoplasmic protein fraction in the supernatant. The pellet was then re-suspended in 15 ml of 20 mM TrisHCl (pH 8.6) containing 1 % Sarkosyl and incubated for 30 min on ice and the ultracentrifugation step was repeated. Upon ultracentrifugation, outer membrane proteins were obtained as pellets and were re-suspended in 20 mM TrisHCl (pH 7.2). Data were analyzed by the Student’s t-test using Sigma Plot Software. Characterization of TP359 revealed that it is rich in the hydrophilic amino acid residue lysine, and has a net charge of +4. Grand average hydropathy value of TP359 was −1.25, indicating its hydrophilic nature, and hence its solubility in water. The TP359 peptide extends hydrophilic amino acids arginine (Arg3), and lysine (Lys4 and 5) residues towards the sides, and Lys8 towards the bottom (carboxyl end) (Fig. 1, a and b). The hydrophilic amino acid Lys contributes the positive charge to the peptide while Arg3, Lys4, Lys5 and Lys8 make it readily soluble. The non-polar amino acids at the N- terminal (aliphatic Met1 and Try2 aromatic amino acids) are followed by a polar positively charged region (Arg3, Lys4, Lys5). The C-terminal has positively charged polar Lys8; the polar, hydrophilic patches are bridged by aliphatic non-polar Ala6 and Leu7 residues. The polar and non-polar features (prominently polar) and the three-dimensional structure analyses show that the peptide may possess the ability to penetrate the cell membrane. Our results show that TP359 was highly effective in preventing the growth of P. aeruginosa. The peptide exhibited MICs as low as 4 and 8 μg/mL and MBCs of 16 and 64 μg/mL, respectively against the mucoid and non-mucoid strains of P. aeruginosa. These values are consistent with the MIC range of another cationic peptide, EC5 for a different strain of P. aeruginosa (ATCC27835) . The positive controls, polymyxin B and gentamicin sulphate displayed MICs between 0.25 and 0.5 μg/mL (Table 3). Time-kill studies were performed to determine the time-frame required for the effective killing of P. aeruginosa by TP359. Our results showed a ≥3 log CFU/mL within 8 h at 4× the MIC and a 5-log reduction of the viable cell count within 2 h at 8× MIC for the mucoid strain (Fig. 2 a). 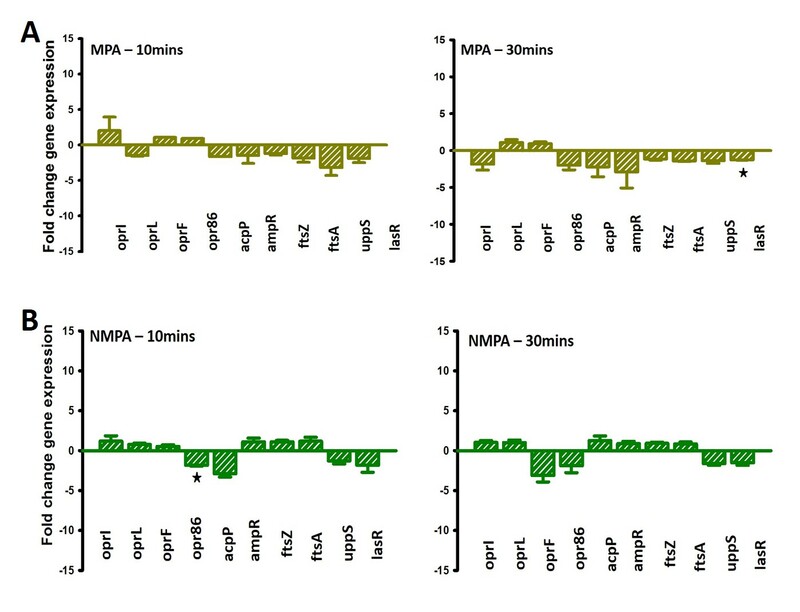 Also for the non-mucoid strain, the viable cell count decreased by ≥3 log CFU/mL within 3 h at 8× MIC (Fig. 2 b). These results demonstrate that TP359 is bactericidal against P. aeruginosa and that its bactericidal activity is dose- and time-dependent. Given the potential consideration of TP359 as a therapeutic agent against P. aeruginosa, it was necessary to examine its toxicity to the human-lung carcinoma epithelial A549 and mouse J774 macrophage cell lines. Our results revealed that none of the tested concentrations (0–200 μg/mL) had toxic effects against A549 cells over a 48 h-time-frame (Fig. 3 a). TP359 was nontoxic to J774 macrophages at lower concentrations but at higher concentrations cells remained viable up to 85 % (200 μg/mL at 24 h) and (100–200 μg/mL at 48 h) (Fig. 3 b). Overall, our data suggest the safety of the peptide for potential in vivo studies. To begin to understand the antimicrobial mechanisms of TP359, membrane permeabilization was studied using the LIVE/DEAD stain kit, consisting of the SYTO9 and propidium iodide (PI) dyes. The SYTO9 labeled all cells (intact and permeabilized/damage membrane) green, while only damaged membranes were labelled red by PI. The percentage of cells with damaged membranes was then calculated relative to the total number of cells at different spots in different samples (Fig. 4 a – f). These data showed that TP359 is effective at permeabilizing the membranes of both strains, as the percentages of damaged membranes for both strains were ≥80 % for the treated samples, in contrast to ≤20 % for the untreated samples. Since results from membrane permeabilization assay indicate OM permeabilization, we sought to investigate if there is a breach of the permeability of the cytoplasmic membrane. This was performed using the DiSC3(5) dye which crosses the outer membrane of the bacterial cells and concentrates at the cytoplasmic membrane. Upon addition of membrane permealization agent, the dye is released into the surrounding medium, and the fluorescence intensity is measured relative to the amount of dye released. TP359 induced membrane depolarization in both strains at 10 to 80 μM was evidenced by the release of the dye. The positive polymyxin B control also induced membrane depolarization at those concentrations, while the negative gentamicin control failed to induce membrane depolarization (Fig. 5). These data show that TP359 depolarized the cytoplasmic membrane of P. aeruginosa, which may lead to cytoplasmic membrane damage and killing of bacteria. We next used electron microscopy to begin to understand how TP359 kills P. aeruginosa. Our SEM images revealed that the TP359-treated mucoid cell population had punctured membranes, efflux of intracellular material, as well as disintegrated and agglomerated cells. Ruptured cell debris was also evident (Fig. 6, b, c), while bacteria without TP359 had smooth cell morphology (Fig. 6, a). The non-mucoid TP359-treated cell population also showed similar changes; cells were disintegrated, with evidence of damages on the membrane (Fig. 6, e, f) as compared to the untreated cells (Fig. 6, d). TEM similarly showed treated cells with compromised membranes and efflux of cytoplasmic contents proceeding into ghost cells (Fig. 7). Both SEM and TEM results established a possible mechanism of action, whereby TP359 interacts with the cell membrane causing membrane permeabilization and degradation, with resulting changes in cell morphology. These results indicate that TP359 caused loss of membrane structure resulting in morphological changes and cell death. Selected critical genes involved in outer membrane biogenesis, peptidoglycan synthesis, cell division and virulence were analyzed to determine the molecular effect of TP359 against both strains of P. aeruginosa (Fig. 8). As shown, TP359 did not significantly alter expression of genes associated with cell division (ftsA and ftsZ) or virulence (ampR and lasR) under either bacteriostatic or bactericidal concentrations (Fig. 8, b and d). Contrastingly, TP359 perturbed the expression of P. aeruginosa membrane genes (oprL, oprI, oprF, acpP and uppS) under bacteriostatic or bactericidal concentrations (Fig. 8, b and d). 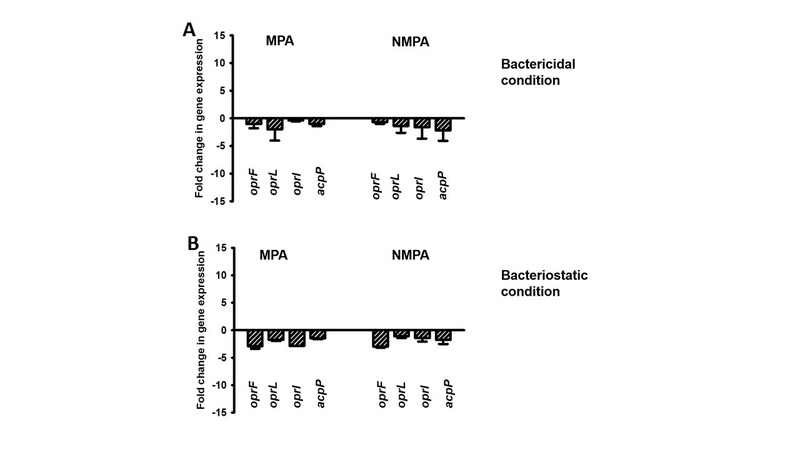 Most notably, under bacteriostatic concentrations there was marked upregulation of the oprI gene (~10-fold) that is essential for membrane integrity in mucoid and non-mucoid strains. Examinations of the genes perturbed under bactericidal concentrations revealed a consistent and significant down-regulation of the oprI and oprF genes (Fig. 8, a and c). As shown, there was a 5-fold decrease in the expression of the oprI gene for both strains. However, the most notable effect of TP359 was on the oprF gene (essential for membrane integrity, bacterial shape, and virulence ), where a significant 10- and 5-fold reductions in its expression was observed for the mucoid and non-mucoid strains, respectively. This important finding shows the effect of TP359 on the oprF gene, which may suggest that disruption of membrane integrity, could contribute to bacterial cell death. Moreover, this result strongly supports the findings of the SEM and TEM analysis, where TP359-treated cells show flaccid membranes, compared to the untreated control cells. Additionally, P. aeruginosa exposed to TP359 for 10 and 30 mins showed no significant changes when compared to the untreated, indicating that a longer period of treatment was required to evaluate TP359 effect on these genes (Additional file 1: Figure S1). Also, P. aeruginosa exposed to gentamicin showed no significant changes when compared to the TP359 treated samples, suggesting that TP359 effect was not merely due to stress (Additional file 2: Figure S2). We confirmed the effect of the peptide on outer membrane proteins by analyzing outer membrane protein fractions of TP359-treated P. aeruginosa using the ExperionTM automated electrophoresis system (Fig. 9 a) followed by semi-quantification of proteins (Fig. 9 b and c). As shown in Fig. 9 a, there was a fully expressed 37.6 kDa OprF protein in both untreated mucoid and non-mucoid P. aeruginosa samples. In contrast, expression was visually absent in the TP359-treated mucoid strain and reduced in the TP359-treated non-mucoid strain samples. This data correlated with our gene expression analysis, where a significant down-regulation of the oprF gene was observed for both strains of P. aeruginosa. The OprL protein expression also was significantly reduced in the TP359-treated samples as compared to the untreated samples for the mucoid (Fig. 9 a and b) but not the non-mucoid strain (Fig. 9 a and c), which is congruent with the gene expression results. The OprI, with molecular weight less than 10 KDa was undetectable because its size is below the detection limit for the ExperionTM automated electrophoresis system. The antimicrobial activity and molecular effects of a novel proprietary cationic peptide, TP359 were investigated independently against a mucoid and a non-mucoid strain of P. aeruginosa. Our results revealed the following: (i) both strains of P. aeruginosa were sensitive to TP359, (ii) TP359 showed no toxic effects against human lung epithelial A549 and mouse J774 macrophage cell lines, (iii) TP359 caused membrane damage, as shown by SEM, TEM, LIVE/DEAD stain and membrane depolarization assay and (iv) TP359 down-regulated P. aeruginosa membrane biogenesis and peptidoglycan synthesis associated genes. TP359 exhibited antimicrobial activity against both strains of P. aeruginosa at MIC concentrations, which is in agreement with most cationic AMPs [35, 37], with comparatively lesser effect on Gram-positive strains. It was essentially non-toxic to eukaryotic cells, which is also in agreement with other AMPs [38–40]. The lack of toxicity of AMPs to eukaryotic cells may be due to their membrane composition, which consists of zwitterionic phospholipids that are neutral in net charge . This neutral charge reduces electrostatic interaction between the eukaryotic cell membrane and AMPs, thus increasing their potential for use as antipseudomonal drugs. Our investigation into the effect of TP359 on the membrane of P. aeruginosa revealed that TP359 caused outer membrane permeabilization, which was further illustrated in the TP359 sensitivity assay, where bacterial cells were sensitive to TP359 (data not shown), suggesting its effect on cell membrane integrity. Generally, the antimicrobial activity of AMPs is mostly attributed to membrane dysfunction, and cationic amphiphilic AMPs are electrostatic, which makes them attracted to the negatively charged bacteria membrane surfaces [13, 26] causing membrane damage. Results from our SEM and TEM analyses further confirm this, together with the leaking of cytoplasmic content. These observations suggest that TP359 may penetrate the bacterial membrane by electrostatic interaction between TP359 and the bacterial cell surface. Although the classic mechanism of action of AMPs is their ability to cause membrane damage, other mechanisms involve the inhibition of cell wall biogenesis, such as the lantibiotics-class 1 bacteriocins, Lcn 972, a class 2 bacteriocin and nicin . Another class of peptides which target cell wall biogenesis is the class of endogenous host defense peptides (HDP) such as the defensins and cathelicidins . Some reports also indicate that membrane perturbation alone may not be sufficient to elicit bacterial cell death [8, 43], so we investigated the molecular effect of TP359 against selected critical genes involved in membrane biogenesis, peptidoglycan synthesis associated genes, cell division genes and virulence genes. Analysis of TP359-treated cells showed that the transcriptional expression levels of some outer membrane genes were down-regulated at bactericidal concentrations, whereas they were up-regulated at bacteriostatic concentrations in both strains. The most significantly down-regulated gene in both strains at bactericidal concentrations was oprF, which encodes a major structural and outer membrane porin (OprF). The reduced translational expression of OprF further underscores its dysregulation by TP359. P. aeruginosa OprF is essential for cell shape, maintenance of peptidoglycan association and structural integrity  and also for complete virulence. Therefore, a down-regulation of OprF expression, suggests a disruption in the outer membrane of the bacterial cell, which could result into a permeable membrane for foreign materials and water, leading to osmosis and cell lysis. This effect of the peptide on oprF expression indeed correlates with our SEM analysis, where TP359-treated cells had a rough shape compared to the untreated cells, indicating defective bacteria membrane integrity. The significance of our findings is further accentuated by the observation that oprF mutants formed poor anaerobic biofilms in the lung of CF patients, and that lung secretions from CF patients with chronic P. aeruginosa infection have increased antibodies to OprF , indicating the significance of OprF for persistent infection. Hence, based on our findings, we could infer that TP359 could disrupt the cellular integrity of P. aeruginosa and increase clearance from CF airways. As a positive control, the effect of gentamicin on the outer membrane genes was investigated at both bactericidal and bacteriostatic condition. Although some of the genes were downregulated in both treated strains, they were not statistically significant, suggesting that the effect of TP359 on these genes may not be due to stress and could be a contributory factor to its antimicrobial activity. To our knowledge, our study is the first to comprehensively characterize the antimicrobial effect of a cationic AMP at the gene level. Based on the novelty of our findings, we propose the possible mechanisms of action of the TP359 peptide (Fig. 10) which may include: i) direct contact with the bacterial cell surface due to the attraction between the negatively charged bacterial membrane and the positively charged peptide ii) permeabilization of the outer membrane either due to the downregulation of the outer membrane gene oprF, which is essential for maintaining membrane integrity and shape; or the presence of the hydrophilic portion of the peptide, in the hydrophobic rich portion of the bacterial membrane resulting in membrane instability, in addition to other outer membrane biogenesis genes and iii) inner membrane depolarization, through the displacement of membrane charges. Our novel cationic peptide TP359 showed antibacterial activity against both strains of P. aeruginosa. TP359 also induced significant morphological changes, and reduced expression of outer membranes and peptidoglycan associated genes specifically the oprF gene, suggesting that the oprF gene could be a target for antimicrobial drug development. Since the use of polymyxin B to treat P. aeruginosa has been abandoned due to its nephrotoxicity, TP359, which showed low cytotoxicity in vitro, may prove to be a valuable therapeutic alternative, especially for CF patients. Further studies would include the study of other cationic AMPs and verification of their effect on outer membrane biogenesis genes, which could enhance targeted antimicrobial effects. These could lead to in vivo investigations of the antimicrobial activity of TP359. We would like to acknowledge Yvonne Williams, Lashaundria Lucas, Juwana Smith Henderson and Amber Grace for their excellent administrative assistance. We also thank Golden muse (www.golden-muse.com) for all graphic illustrations. This work was supported by NSF-CREST (HRD 1241701) grant. The funding body had no role in the design, data collection and interpretation, analysis and writing of the manuscript. ED, AC and VD participated in the experimental design, data analysis and interpretation. ED, SB, MB and VD wrote and reviewed the manuscript. DO, SS and SP provided materials. ED and AC participated in the bench work and data analysis. All authors have read and approved the final manuscript.